A roll of steel cable. The definition of cable means a rope-like bunch of wires used to connect two things. The cord that connects your phone to the wall socket is an example of a cable. The connection between your computer and your internet service provider is an example of a cable. "cable." YourDictionary, n.d. Web. 19 April 2019. <https://www.yourdictionary.com/CABLE>. To supply or fasten with a cable or cables. Middle English from Old North French from Late Latin capulum lasso from Latin capere to seize ; see kap- in Indo-European roots. 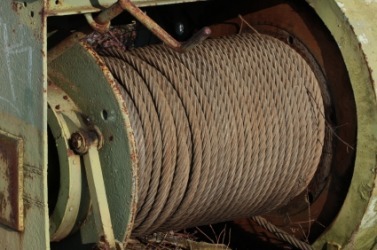 (nautical) A heavy rope or chain of at least 10 inches thick, as used to moor or anchor a ship. (communications) A system for transmitting television or Internet services over a network of coaxial or fibreoptic cables. (architecture) To ornament with cabling. Recorded since c.1205, from Old Northern French, from Medieval Latin capulum (“lasso, rope, halter”), from Latin capiō (“to take, seize”). A group or bundle of conductors, fibers, or wires, or bound together, sharing a common protective sheath or jacket, and perhaps strength members and shielding. See also aerial cable, direct bury cable, submarine cable, and underground cable. See also conductor, fiber, and wire. The exchange rate between the U.S. dollar and the British pound sterling. The rate was transmitted over the transatlantic cable from 1866, and the initial novelty of the communication method gave the exchange rate this name. Cable also refers to sending a message electronically or transferring funds. He used to make a cable for his anchor of strips of hickory bark tied together. From the continuous records of slack and strain combined with the weight of the cable it is a simple matter to calculate and plot the depths along the whole route of the cable as actually laid.